A good option to consider when planning an update in your bathroom is ceramic tiles. These are great on the floors, walls and in the shower and come in a wide variety of styles and designs. Ceramic tile has been used in homes for centuries and offers an excellent way to add some texture and pattern to your bathroom. Glazed ceramic tile is better for bathroom walls and countertops because it has a very low slip resistance when it's wet making it an unwise choice for a bathroom floor. This type of tile is made up of two basic elements - clay and water. The surface of the tile is coated with a colored glaze which is similar to a glass finish. Porcelain tile is made from a blend of fine-grain clays and other minerals creating a very moisture and stain-resistant product. Because of these features, porcelain tile will withstand years of wear while maintaining its color and beauty. One of the great things about tiling a bathroom is that you get the chance to experiment with bold colors and unusual designs and creating a wall pattern with tile in your bathroom can be especially striking. Consider using a solid background of tiles combined with brighter accent tiles. Or how about adding a few decorative tiles on a solid tile background such as in a classic floral or seascape or funky art mosaic to for a truly distinctive look on your bathroom walls. In terms of tiling a bathroom floor, it usually takes on average, about two to three days to complete. A good tip when considering types of tiles for a bathroom floor is that tiles are evaluated for wear resistance on a scale from 1 (lowest) to 5 (highest). A PEI-1 or Light Traffic rating is recommended for areas such as bathrooms where shoes are not consistently worn. 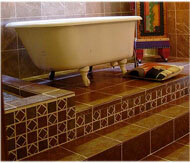 Natural stone tiles such as granite, slate or sandstone are the best choice for bathroom floors. They have a high slip tolerance when they're wet and can add a degree of boldness and earthiness to a room that you and your family spend so much time in. Some people may see having a tiled bathroom floor as a disadvantage because they think that tiles have a consistently cool surface. But depending on the size of your bathroom and how well your house is insulated this really shouldn't be an issue for you. If you are set on using tile for your bathroom floor and are still concerned about the temperature issue, you can always purchase a tile warming system. With no costly ductwork or plumbing requirements, this system's installation can be conveniently performed with the addition of an adjustable thermostat. Copyright© 2019 bathroomcentral.com. All rights reserved.